A cool, fresh New England breeze invigorates the #sparkchamber today as we welcome Judi Jorge. Judi is a life-long, primarily self-taught artist who studied at Montserrat’s program of continuing education, The Museum School, and with various local artists. Her style is realistic, and she works primarily in acrylic and graphite. 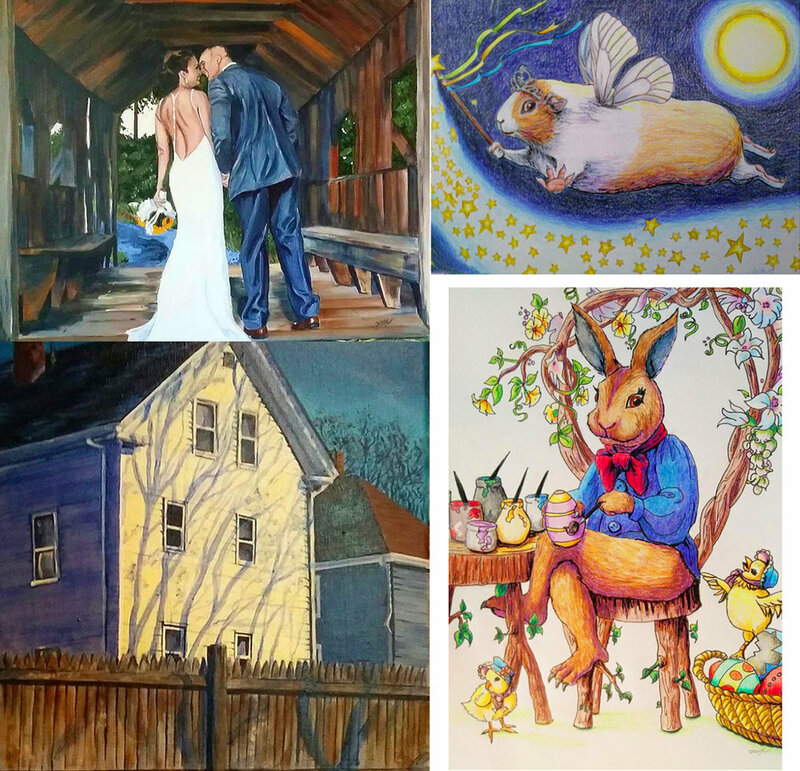 She also does more whimsical, illustrative pieces in art marker and colored pencil. Painting for her is the act of capturing light and color that evoke memory and feeling. Each original painting is a vignette of her life, sometimes painted romantically, sometimes in stark reality. As her body of work grew, she realized it was a visual diary — an interpretation of past experience as well as a reflection of life experience during the time of the actual painting process. She lives and works in Beverly, Massachusetts with her husband Fernando and kids Joe and Julie. Judi also does commission work — primarily portraits of people and animals — teaches painting and drawing, and she is mad about guinea pigs! Visit her website and Etsy shop, or better yet, experience her artistry in person. An exhibit of her work is on display through the end of July at the Northshore Unitarian Universalist Church in Danvers, MA. The show, Songs From About Midnight, features many of her acrylic paintings as well as graphite and colored pencil pieces. Meet the artist and enjoy some refreshments at a reception this Sunday, July 1, from 2 – 5 pm. Everywhere. Light, color, shadow, emotion. It’s something I have to do. I’m obsessed by it. I am an early bird. My work is generally pretty tiring, so in order to concentrate and put into the piece the work I need to execute it, I need to be energetic. I start with the inspiration, and paint the piece in my head a bunch of time before I even start. [This is usually done while I’m doing chores, running errands ... or at my day job!] Once I have it plotted out, I have the tenacity of a pit bull and spend every possible moment working. I get it out into the world primarily by social media.